There may have been a point in time when the Ringling Bros. and Barnum & Bailey Circus was indeed “the Greatest Show on Earth.” For at least the past few months though, the stock market has supplanted that spectacle. Granted, the stock market today has done so by becoming something of a circus in its own right, poked and prodded by worries regarding inflation, fears of a trade war and plain ol’ volatility. Nevertheless, it’s been amazing to watch, with a little something for everybody. There’s a downside to the theatrics, of course. That is, the noise has made it difficult to get a grip on the true state and status of the stock market. If you’re not quite sure what to think, keep reading. Where is the Stock Market Today? It may be anti-climactic to begin with the conclusion, but it’s a necessarily evil — the stock market today looks like it’s getting back into the bullish mood/mode it was in as of the beginning of the year. It’s a hint not to be trusted though, as there’s actually very little conviction behind the bullishness. It’s an idea that needs some explaining. To its credit, it looks as if the S&P 500 has finally shaken off all the trouble it stumbled into beginning in early February. 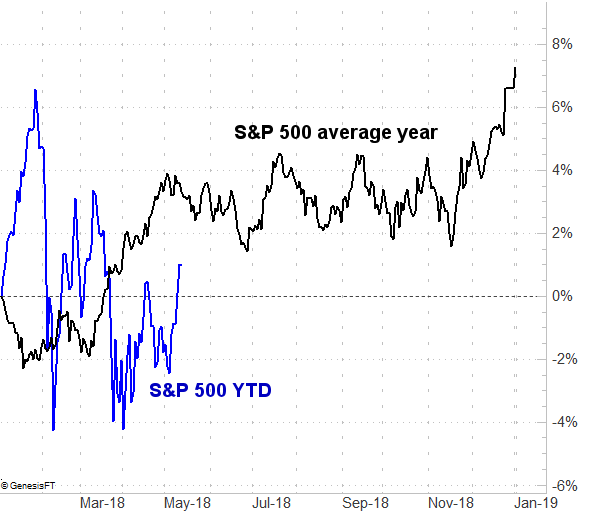 After getting more than a little overextended through late January, the profit-takers came out of the woodwork at the first sign of trouble, and they stuck around for the next three months to up-end any rally effort before it was able to develop in earnest. 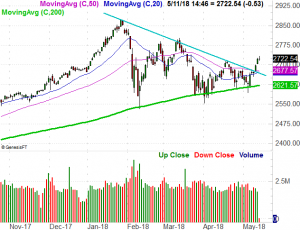 With this past week’s break above a key resistance line and a couple of key moving average lines, the index may finally have some room to run. Take a closer look at the chart above, however. 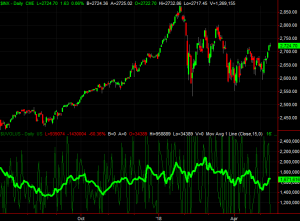 Specifically, take a look at the volume bars; the green ones mark bullish days. 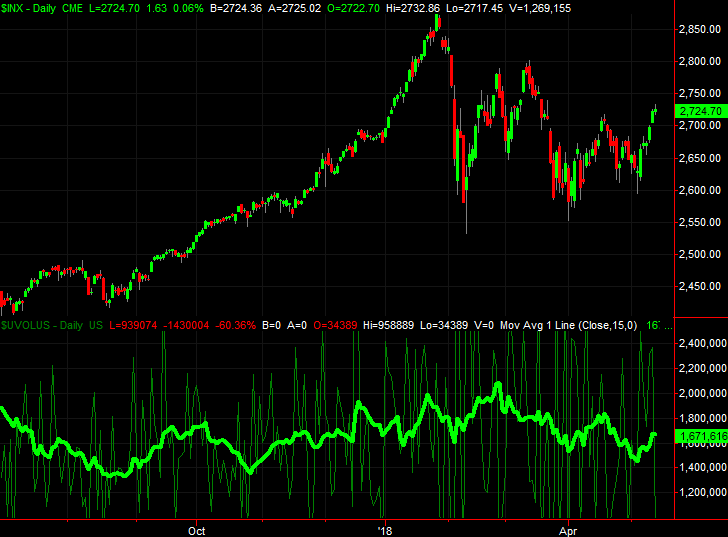 Or, better still, take a look at the chart below, which plots the S&P 500 index along with the daily bullish volume levels for the market; the thicker, brighter green line is a moving average of the daily “up” volume, showing us the true strength of the undertow. Although we’ve seen the bullish volume trend perk up over the course of the past week, it still pales in comparison to the levels of bullish volume we saw late last year when stocks were raging. This image is also a not-so-subtle reminder that the last couple of upward thrusts lacked meaningful volume. In other words, there aren’t really a lot of believers in the spotty bullishness we’re seeing from the stock market today, and within the past few days. It matters. If a breakout move is to have any longevity, it has to gather participants on the way up. We just don’t have that. It may be more of a seasonality problem than a conviction problem. It’s still a problem though, and one we can’t afford to face this time of year. May and June tend to be tough months for stocks, though we often find a reprieve in July, August and September throw the market right back into the fire. That may not be a liability this time around, in that the S&P 500 is already trailing its average YTD performance. On the other hand, the fact that the S&P 500 is sub-par this year may well mean it’s on pace for a sub-par year altogether. The irony is the stock market today has rather impressive fundamentals. For the first quarter of 2018, the S&P 500 boosted its earnings by 28%, on pace to report first-quarter per-share profits of $37.06. Granted, tax cuts helped. So too did the ongoing recovery in oil prices, which is pushing them deeper and deeper into the black. Almost all sectors logged significant year-over-year earnings growth though, even beyond the benefit of President Trump’s tax rate overhaul. More of the same progress is expected going forward. On the flipside, with a trailing price-to-earnings ratio of 20.5 and a forward-looking P/E of 16.9 in an environment where interest rates are (finally) on the rise, investors have been reassessing whether or not they’re really willing to pay a rich price for stocks when first, money isn’t as cheap for companies to borrow as it once was, and second, yields on bonds and dividend stocks are paying relatively better than they had been, making growth stocks at least a little less attractive. Sure, rising interest rates temper inflation — inflation that mostly exists because companies and consumers are doing rather well. It’s a narrow tightrope to walk though, and the balance that may work for the stock market today may not be the one that works for it tomorrow. 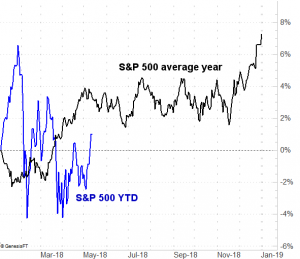 And yet, nobody can deny that stocks are once again trying to edge higher, and the money-making bet more often than not of late has been betting on stocks rather than against them. So what do investors do, knowing stocks aren’t exactly “worth it” and knowing this current rally effort isn’t as strong as it seems? There’s the rub. Short-term-minded traders know the market still has a valuation problem, but they also know the market’s recent volatility has persistently rewarded bulls willing to buy on the dip. Long-term minded investors know the market’s proverbial primal instinct has been a bullish one, but that stocks are overvalued and due for a corrective move. For lack of a batter way of saying it, the side that comes to its senses first and capitulates actually loses. And yet, a sweeping cathartic move may actually be the least likely outcome anytime soon. Realistically speaking, stocks are most likely to continue chopping around for the foreseeable future, logging no significant gains or losses, frustrating most participants most of the time. Part of that chop can be attributed to the calendar. Part of it, however, can also be chalked up a huge number of traders and investors who are struggling to process a myriad of mixed messages. It’s annoying to the point of being frustrating, but it is what it is. Stocks won’t be able to move “normally” again until we see the melt-up or meltdown neither side seems willing to dish out at this time. Whatever the case, be patient. The catalyst will get here sooner or later. Article printed from InvestorPlace Media, https://investorplace.com/2018/05/making-sense-senseless-stock-market/.